← Is it over for Grant Hill? Wages of Wins Podcast – Eric Weiss on a different type of advanced stat. Another week, another Wages of Wins podcast! We have a plethora of ways for you to hear us. Eric Weiss (@EricWeiss_SA) of Sports Aptitude stopped by to discuss a different type of advanced stat. Eric actually works using player psychology and behavioral science to help NBA teams help player development. A player’s environment can dramatically alter performance. Eric points out that the first several years of a player’s career are key to success (and the data agrees)! Teams don’t spend as much time focusing on setting up an environment to ensure every player succeeds. Figuring out a player’s personality and how to set up a good environment for them to learn the right way could be key to success (maybe one team knows this already). Eric points out that this is hardly novel for the business world. However, it’s a relatively new field in the NBA. Of course, this subject would not be complete without lots of talk about Carmelo Anthony and Andre Drummond and how our initial assessment could be so off! So tune in and learn how the landscape of player development could be changing in the NBA. 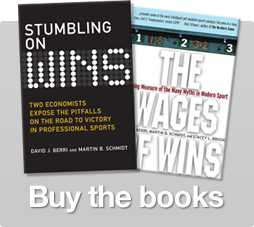 5 Responses to "Wages of Wins Podcast – Eric Weiss on a different type of advanced stat." This sounds like there will be evidence, but I am already skeptical of the evidence. How much variation is there in “player environment”? I am referencing league-wide variation and team level. If you keep finding that the Spurs and Thunder create a psychologically great “player environment”, then I wonder if there is any causal evidence. Much like telephone poles and cancer rates, we find that areas of developing countries with a high number of telephone poles have higher cancer rates than the rest of the country. So do telephone poles cause cancer? Well data could show it, but the cause is likely from some other factor than telephone poles. All of this to say that I hope to see a reason why psychology matters based upon evidence that isolates this effect. The Spurs and Thunder have other similar qualities than “player environment” that could confound the results. Great segment. Quick-and-dirty it seems as if most teams are using an antiquated, industrial-age factory model. Neglecting corporate (team) culture, soft skills and woefully inadequate human resources departments (support/training/development) seem to be the norm. Robert Nideffer has addressed the 5 personality types and has consulted for teams. Personalized training/development programs echo John Dewey’s Laboratory School model of a century ago. Common sense isn’t so common; the same issues still plague corporate America and our educational system. Einsteins’ quote about expecting fish to climb trees seems apt…it’s important to find the right fit. Fast forward to the end of his 2nd year. 5 bigs ahead of him in the pecking order, shooting like 0% on FTs. Looking like he’s shell shocked. Ladies and gentlemen, the Washington Wizards player development system! Where everyone regresses!